Among the early surprises of the MLB season are how bad the Red Sox and Yankees have played and the fast start for the Mariners, who were thought to be tanking the season. Both things have had ramifications in fantasy baseball, as has the hot start of a Royals outfielder. Among the early surprises of the MLB season are how bad the Red Sox and Yankees have played and the fast start for the Mariners, who were thought to be tanking the season after trading James Paxton and Robinson Cano, and letting Nelson Cruz walk in free agency. Those situations have had fantasy baseball ramifications for the better (Daniel Vogelbach a top-5 first baseman) and the worse (Giancarlo Stanton, J.A. Happ, the aforementioned Paxton, Rick Porcello, Chris Sale, and, to a lesser extent, even Mookie Betts). You're not going to drop any of those guys (except maybe Porcello), but there's certainly concern for each, and there's someone from Boston you should cut ties with (more on him below). Before we get to this week's list of add/drops, a quick look back at [last week](https://www.betchicago.com/fantasy-baseball-waiver-wire-add-drop-mlb-april-8), albeit with a small sample size. Among the adds, Kevin Kiermaier went 6-for-21 (.286) with a two doubles, a triple, four runs and three RBIs in five games, Yonny Chirinos had his first poor start of the season (though I still like his long-term potential) and Diego Castillo earned another two holds in two outings without allowing an earned run. Among the drops, Rougned Odor went on the injured list with a knee sprain, Zack Wheeler had a nice start in Atlanta to earn his first win of the season and Andrew Miller had three scoreless outings, but he earned only hold, diminishing his fantasy value. Let's get to the three players you should add and three you should drop for Week 3 of the fantasy season. (Reminder: I'll suggest adds only for those rostered in less than 50 percent of Yahoo leagues as of Monday evening and drops for those rostered in more than 50.) 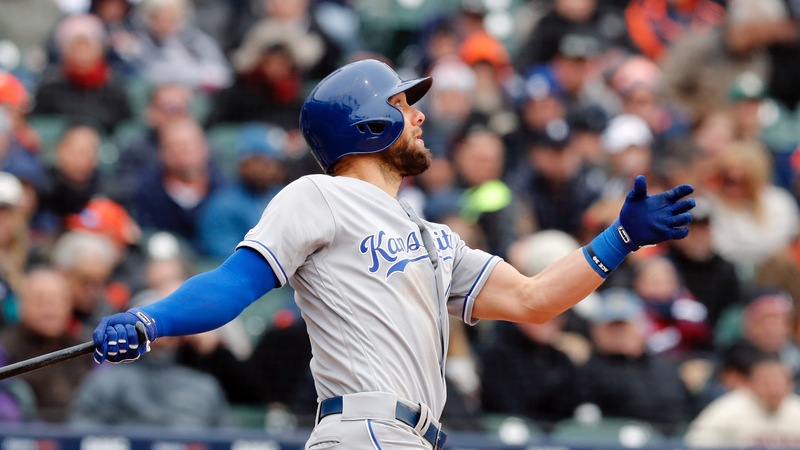 __MORE:__ [Reasons to hold off on Rays to win World Series bets ... for now](https://www.betchicago.com/reasons-hold-off-world-series-rays-bets-futures) ## Fantasy baseball adds __OF Alex Gordon, Royals (rostered in 47 percent of leagues):__ This one is close to my cut-off line, so Gordon might already be scooped up in your league, but if he's not, grab him. The 35-year-old (are you as dumbfounded as I am that he's that old?) has seven multi-hit games in his last 10, including a four-hit night and a home run Friday in a win over the Indians. He's been quite an underwhelming fantasy player the last few years, but if he can stay healthy, 20 home runs and 85 RBIs isn't out of the question, which would make him a decent fourth outfielder/utility man for your roster. For me of a deep dive into Gordon's hot start, click [here](https://blogs.fangraphs.com/examining-alex-gordons-hot-start/). <a href="https://www.youtube.com/watch?v=21f6XEadUyU" class="embedly-card" data-card-width="100%" data-card-controls="0">Embedded content: https://www.youtube.com/watch?v=21f6XEadUyU</a> Vogelbach, who is hitting .378 with six homers, is owned in 66 percent of leagues, in case you were wondering. I'd suggest you add him if he's still available in your league. __Starting pitcher Nick Margevicius, Padres (36 percent):__ The 22-year-old has allowed only three runs in 16 innings and two came on solo home runs. He doesn't give that much length (only five inningsin two of his starts), so his quality starts might not be that high. But he's struck out 12 to only one walk, so his ERA and WHIP are strong. __Reliever Lou Trivino, Athletics (24 percent):__ Blake Treinen is firmly entrenched as the Oakland's closer, but veterans Joakim Soria and Fernando Rodney are off to rocky starts, leading to Trivino being called in for more high-leverage situations (and thus more holds). He has allowed a run in only one of his 11 outings, with a 13/1 strikeout to walk ratio. Doesn't get much better than that. ## Fantasy baseball drops __1B Miguel Cabrera, Tigers (74 percent):__ He's just not the same player he once was, and there are too many good first baseman (see: Vogelbach) to keep him on your roster. Cabrera, the former Triple Crown winner and two-time AL MVP who turns 36 on Wednesday, has no home runs and only one extra-base hit in 15 games. His one saving grace is that he's still getting on base (.365 OBP), but that's not enough for him to have fantasy value. __SP Nathan Eovaldi, Red Sox (62 percent):__ I'm not sure why everyone was so high on him. Yes, he was good in the postseason last year, but he's never finished with an ERA less than 4.00 in a year he's made more than 18 starts. He allowed an astonishing six home runs in 15 innings, and he has 10 walks (and a HBP) and only 10 strikeouts. Far better options on the start-pitching market. __RP David Robertson, Phillies (70 percent):__ Putting him on this list for [the second time this season](https://www.betchicago.com/fantasy-baseball-waiver-wire-add-drop-mlb-opening-weekend) because not enough of you listened the first time, and because he just went on the 10-day injured list with soreness in his throwing elbow. The 34-year-old former White Sox reliever is not Philly's closer and likely won't ever be after this latest setback. __PLAY:__ Our [free daily contests](https://betchicago.chalkline.com), including [MLB Daily Pick 5](https://betchicago.chalkline.com/games/mlb-daily-pick-5), for the chance to win a BetChicago prize pack.